As one of Washington’s most beautiful and culturally sophisticated cities, it’s no surprise that people from across the country are looking for luxury homes in Gig Harbor. 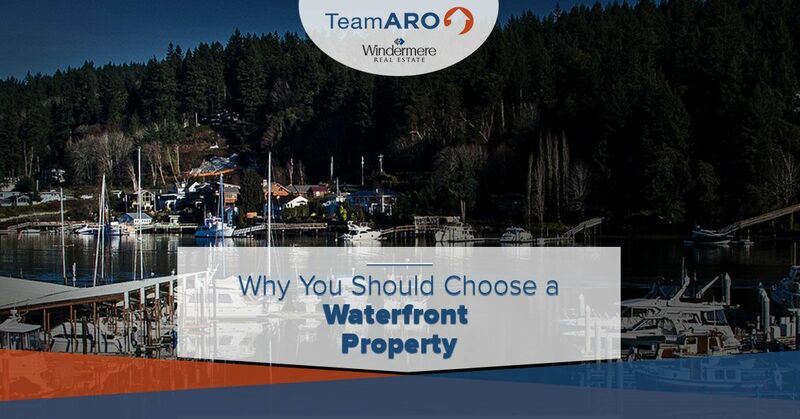 Owning a waterfront property is the ultimate lifestyle upgrade, and we would love to help you find a home that meets each and every one of your preferences. In today’s post, we’ll provide you with detailed information about why you should choose to purchase a coastal home in the area. If you’re ready to begin the search for a Gig Harbor waterfront property, then reach out to us by phone or by email! We look forward to speaking with you soon. If you’re looking for a luxurious waterfront home in Gig Harbor, then get in touch with Team Aro at. www.teamaro.com/home! As Gig Harbor’s premier real estate team, we’re here to help you find the luxury real estate you’ve always wanted. The Gig Harbor real estate market is currently one of the hottest and most lucrative markets in Washington. Unparalleled beauty is one of the main reasons people choose waterfront properties in Gig Harbor. There’s almost always less foot traffic and road noise around waterfront areas, meaning that you can sit outside in the mornings and in the evenings without being bothered by the noises of the city. Moreover, is there really anything better than sipping your morning coffee as the sun rises over the water? With extraordinary colors lighting up the sky and the water, we have a feeling that you’ll answer this question in the negative. Plus, whether you’re standing in the kitchen or looking out of your bedroom window, you’ll always have access to a breathtaking view. With the water just a short walk from your home, you will almost certainly be participating in the local watersports and boating community. Perhaps you’ll invest in a small boat that you can take out in the evenings, or maybe you’ll stay back on the beach and just take in the sights. If you have a dog, then you’ll love the ability to take your pup out for a short walk along the beach, and you may even want to let them go for a short swim! No matter how you choose to spend your time, you’ll love having easy access to the water. When looking for an investment property, many people choose to purchase homes and condos in the mountains or along the coast of major cities. While everyone is entitled to invest their money as they see fit, the real estate market in Gig Harbor is currently one of the most lucrative. As we noted in a previous post, now really is the perfect time to be looking for a luxury home in Gig Harbor. 83 percent of the residents in Gig Harbor own homes, and with a recent report stating that home values could appreciate upward of 7.5 percent over the course of the next year, it’s safe to say that these homeowners have made smart decisions. Team Aro is proud to be your trusted team of Gig Harbor Realtors®. We know that it can be difficult to find the perfect waterfront property, but we’re here to help you understand your options and find the right home for your needs. Keep an eye on our blog page to keep up with all of our posts about luxury real estate in Gig Harbor, and click the button below if you’re ready to get started!